& I think it's imperative that you give the cards away at the end of this effect. (See my discussion below.) This is no great inconvenience. 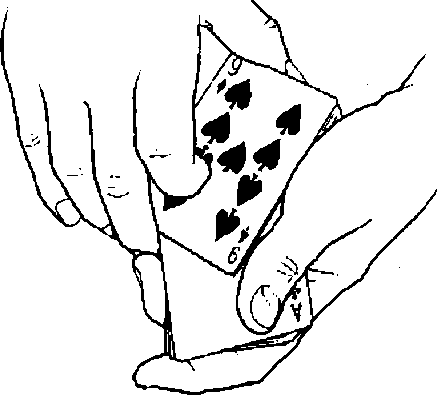 If you buy a box of double-backed cards and a regular deck of cards, you can put together thirteen sets in no time. (It's particularly easy, if you can do a faro shuffle. I'll leave you to work out the details.) The cost of each set is only a few pennies. Pop each one into an envelope and you're ready to go. This effect is a favorite of mine for working tables at banquet shows. i'll place a dozen or so envelopes in my jacket pocket and I'm set for the evening. At rhe end of the night i can tell how many tables i've worked by counting the number of double-backed cards that have accumulated in my pants pocket.